Today, there's more choice than ever in how you play RuneScape, with the EoC/Legacy Mash Up – a set of interface and gameplay options fresh out of the beta. Previously, you had the choice of playing RuneScape with the Evolution of Combat system and complex, customisable interfaces, or in Legacy Mode, with old-style, low-intensity combat and traditional, fixed interfaces. Enjoy! This is just the first of a number of updates coming your way from the current round of beta testing. If you haven't already, get involved! It's the best way to have your say in some of RuneScape's most crucial updates. 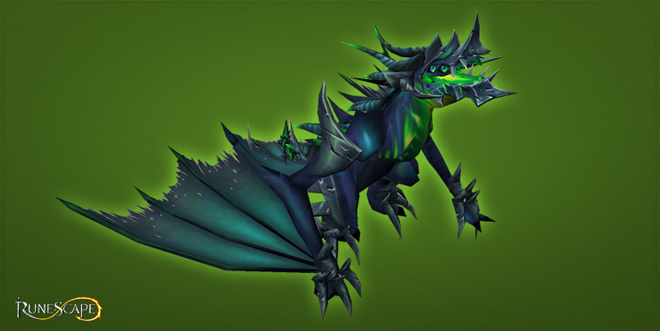 Solomon's roster of legendary pets just got hotter with the shadow drake and fire drake! There's no more ferocious friend to take on your adventures than one of these winged beasts, who – like all legendary pets – have three stages of growth, plus emotes and a load of useful abilities. The shadow drake is available for a limited time only, so it's sure to become a rare sight. Get your drake now at Solomon's Store! On top of this, Solomon's reduced the price of legendary pets – the exclusive shadow drake excepted. Pet collectors rejoice! If you need more RuneCoins, you can redeem Bonds in-game, or purchase more via the website. Congratulations to Sailthree – the winner of our recent shadow drake competition – who was first to suggest the winning name of Fury. This is now immortalised in-game as a pet name option. Check the forum thread if you entered and want to see if you were a runner up – your shadow drake is winging its way to you! To accompany the release of the two drakes, we've revamped the way that legendary pets work. Legendary pets can now have up to three abilities active at one time. These are equipped in slots, which are unlocked as your pet reaches new growth stages. Slayer finisher: your pet will automatically finish off slayer monsters that usually require an item, saving you an inventory slot. Item repair: once per hour, you can use a repairable degrading item on your pet to repair it immediately. This works – and costs – the same as using the POH armour stand. Beast of Burden: use a beast of burden familiar pouch on your pet to grant it the according level of BoB capacity. You must have the necessary Summoning level to use the pouch, and you can use more pouches to stack or renew the duration up to 2 hours. High Alchemy: once per 10 minutes, use an item on your pet to convert it to coins, as per the High Alchemy spell. This requires no runes, and gives no Magic XP. Requires 55 Magic. Fertiliser: every hour, your pet will answer the call of nature. The results – only viewable to you – can be picked up for six buckets of super compost. Life Saver: your pet will save you from death, as per a ring of life. Note that this does not work in PvP areas and has a two-hour cooldown (logged-in time). Note that life saver, slayer finisher, repair item and fertiliser aren't available for Ironman accounts. Forage has an improved drop table, and foraged coins are now added straight to your money pouch. Scavenging now begins as soon as the ability activates, has an improved interface, and your pet will more reliably deliver items it picks up. Setup has been simplified, offering auto or manual set up, and dismantle or research modes. The spring cleaner can now be made more effective by using springs, increasing research XP and dismantle efficiency – even unlocking the ability to break down noted or stackable items. You can fully upgrade immediately at a cost of 10,000 springs, or your cleaner will upgrade over a series of tiers as it uses springs normally. Spring capacity has increased to 250,000. Crossbows and battlestaves are broken down into more useful items. Items that the spring cleaner fails to break down are dropped to the floor. Lists all Treasure Hunter items that you own. Allows you to search by typing in an item name. Allows you to destroy unwanted items, or convert eligible items to coins. From this week, there's a brand new streaming schedule for you to enjoy, with regular slots for our Developer Q&A and Community streams. Our weekly developer Q&A will be your chance to ask questions to our team of developers, about recent updates, upcoming plans, and any other burning RuneScape-related questions you may have. You can ask your questions on this forum thread, or using the #RSDevQA hashtag on Twitter, or on Reddit. So tune in at 16:00 UTC this Tuesday on Twitch to get your first taste of Q&A action! Here's where we get to have some fun. Each week we'll be bringing you something different, fun, and showing off content you won't have seen before. Hosted by the Community Team, it's the perfect accompaniment to your daily Scaping. This week's stream: opening 10,000 Easy Clue Scrolls with Mods James and Wolf. Check out the loot and work out the drop rates - all coming up this Tuesday on Twitch. Be there! Have a great week of Scaping, and let us know your thoughts over on the forums. The RuneLabs criteria change tomorrow, to a small-sized Halloween/horror-themed update. Start thinking about the sort of scary ideas you'd like to see in game!